Sensory play is important for kids of any age. And, the younger we can get them started, the better. When we incorporate sensory play into a baby’s day, we are helping their sensory systems get a jumpstart in understanding this world of noises, smells. 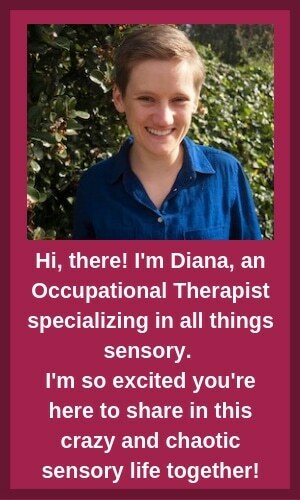 So, how do you help your baby with sensory play? Below you’re going to find a variety of DIY sensory play activities you can do at home, as well as some great sensory products. The great thing about babies is that their brains are craving sensory information. Sights, sounds, smells, textures, and tastes are the fuel to the brain’s fire. Regardless of whether you focus on sensory play or not, your baby will have a wide variety of sensory experiences every day. That said, we can add more fuel to the fire by incorporating intentional bouts of sensory play into our daily routines with our babies. When talking about sensory play, food is a real winner. Food incorporates all of the senses—smells, tastes, sights, and textures. Using food for sensory play has the added benefit of exposing your child to new food. Honestly, whenever your kid eats with their hands, they’re having fun with sensory play! Instead of seeing mealtime as solely a time to eat, step outside the box and see it as a time for sensory play with your baby. This will open your mind to all of the sensory fun that can come with food. Playdough helps kids get used to squishy textures, and strange textures in general. While you may not want your baby eating this playdough, at least you’ll be assured that nothing will happen if they do. Slime is similar to playdough but is more sticky and slippery. If your baby is comfortable with playdough, slime may be a good next step. Given that edible slimes are usually made out of candy, I wouldn’t suggest encouraging your baby to eat them. Water beads are great for sensory play, but typical water beads aren’t safe for babies. Fun at Home with Kids has a great recipe for non-chokable, non-toxic, mini water beads made out of seeds! It may be obvious that music is an important part of the “sound” sense. That said, from a sensory standpoint, we often aren’t intentional about what types of music we’re playing for our babies. Try mixing up the genre, find songs with different instruments, look for songs with sound effects. You’ll see some great products further down the post that make some great sounds but, this is something that you can easily do on your own given the invention of YouTube. While I’m not throwing down opinions on screen time, YouTube songs have the benefit of exposing your child to lots of colors and movements along with the dynamic sounds. I know we’re all sick of Baby Shark, but it actually has a lot going for it from a sensory perspective. Take a Look Around the House and Get Creative! Babies are great in that they find almost anything interesting. Good luck with that as they get older! Almost anything in your house can be used for sensory play (with supervision and safe things, of course). 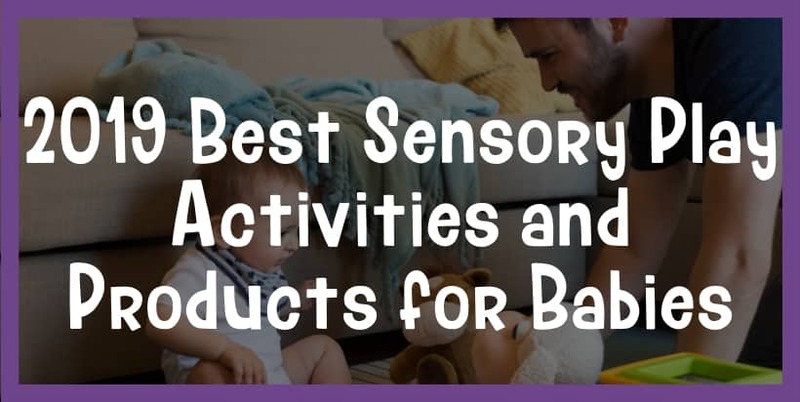 Let’s take a look at how we can use every day products for sensory play with your baby. Dirt: there is so much going on here! #1 is that your baby will get used to being messy. There are also a LOT of textures in dirt, from grainy sand to mushy mud. Sponges: not only are sponges nice a squishy, they also go great with water. Further down, you’ll see my recommendation for a water table that would go perfectly with sponge sensory play. Paint: let’s start finger painting! As with the dirt, paint helps your child get used to being messy. Paint also has a nice slippery texture that contrasts well with the roughness of the paper. Shaving Cream: as an adult, I can’t even understand shaving cream. It’s this weird puffy texture that’s oddly satisfying. Rain: when it’s raining, go outside and play in it! Rain is really interesting from a sensory standpoint. Not only does it help your baby get used to water, it also helps them get used to unexpected water. Some kids really struggle with sensory experiences when they’re unplanned. The inconsistency of rain drops will help your baby get used to raindrops hitting them at random intervals. When we’re looking for sensory play products, we want anything that is colorful, musical, or feels interesting. Basically, anything that’s going to be loud and obnoxious. Here are a few suggestions. I LOVE water tables and how they can offer a wide array of sensory experiences. As we talked about above with rain, splashing in a water table can help your baby become used to unexpected sensory sensations. 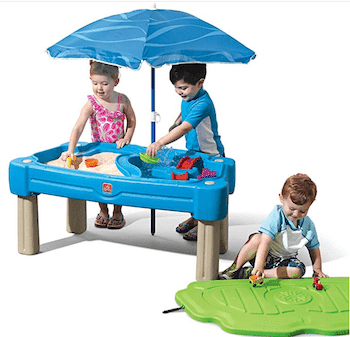 Water tables are also great in that you can add anything to them like sand or toys. 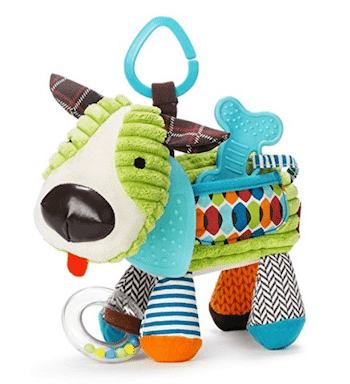 Not only do these additions allow for more fun, they also let you increase the amount of sensory experiences that your baby can have. We want our babies to be exposed to all different sorts of sounds. What’s even better is when we can pair sounds with movements, colors, textures, or other visual aspects. There are an endless supply of toys that combine sound with another sensory experience. Here is just a selection. We want our babies to get their hands on all different types of textures. Whether rough, slimy, smooth, or rocky, different textures help the brain get used to and make sense of all of the objects around them. 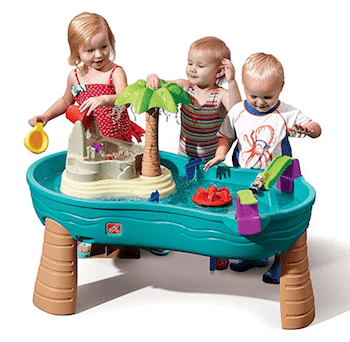 As we noted with water tables, items such as the sand box are listed for babies 18 months+.